Beer with chocolate? Absolutely! My husband, Keith, stumbled across a Coffee Porter by Real Ale Brewing Company that was fantastic. Since it is a porter and it contained coffee naturally we thought about tasting it with chocolate. It went extremely well and I decided to find out if there were other types of beer that paired well with chocolate too. To my surprise there were many. We experimented with several and have come up with some of our favorites for you to try. If you can’t find the Russian porter we tried, most any porter will work. We tried one by Anchor Brewing Company and it paired very well with milk and dark chocolate. 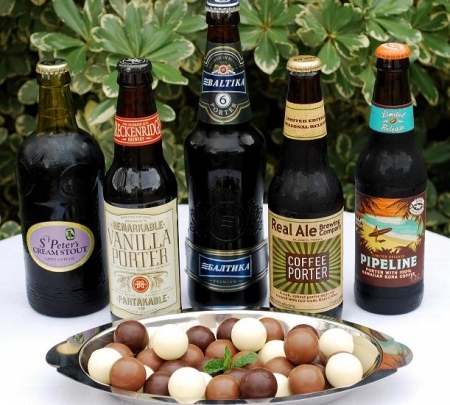 Try the selection of beers with Milk, Dark and White Chocolate Covered Mini Cookie Cakes with a Simple Raspberry Sauce, Trio of Chocolate Cups with Berries or Chocolate Covered Strawberries. If you have a favorite please let us know we are always searching for great beers! Cheers! Remove cap with a bottle opener pour into glasses, drink responsibly and enjoy! To enjoy the true flavor of the beer don’t serve icy cold.